There is a short course in machine knitting going on in Chicago now, and thanks to the wonders of the electronic neighbourhood, I've been chatting with Jesse Seay, whose baby this course is. The sponsoring centre is Pumping Station:One - Chicago's Hackerspace, and you are probably not surprised to hear that there is a higher than average enrolment of men. Rectangles, approached with the right sort of imagination and a suitable colour palette, will provide many projects to be going on with. Scarves are good, and acceptable to a wide cross section of the male population. It does not look too lacy. 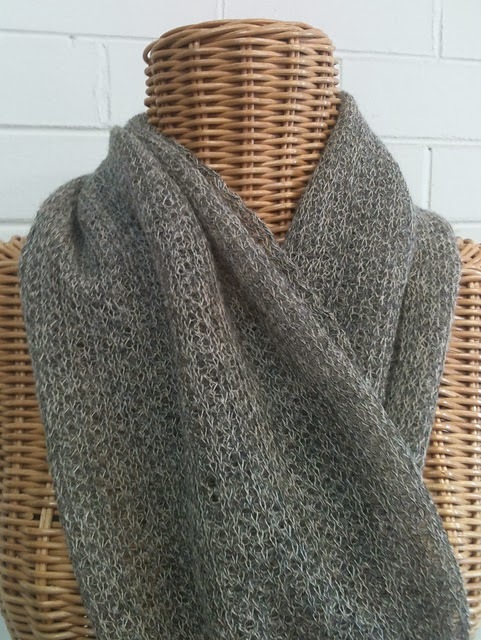 It works well with lace weight alpaca or cashmere to make lightweight but very warm fabric. An open knit, lightly fulled tuck lace will lie flat even though it comes off a flatbed machine without ribber attached. The younger, hipper end of the market in freezing Chicago will probably appreciate a really big scarf, might even be prepared to call it a shawl. 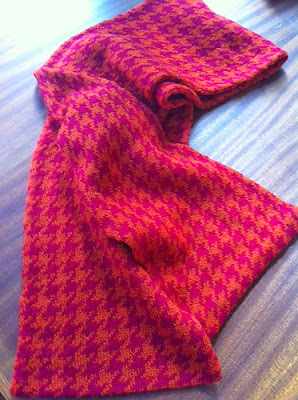 Fair Isle is another of the glories of the knitting machine. The process and possibilities vary between machines, but it is a clever knitting process that you can delegate to the machine. The easiest way to impress an audience of the uninitiated, is to set up a Fair Isle pattern and let the interested bystanders move the carriage to and fro and create a row of kangaroos or whatever. 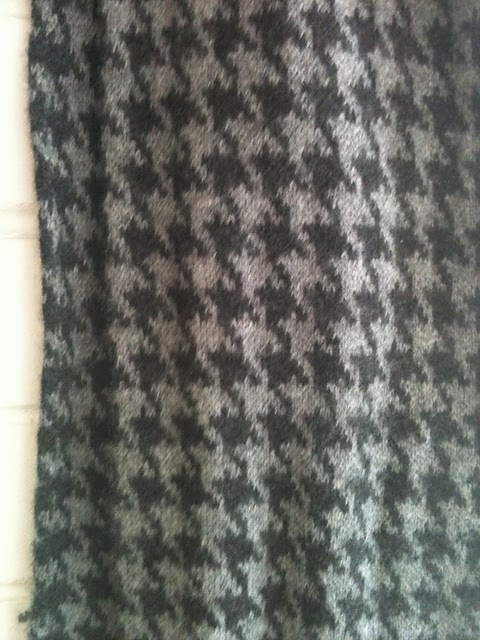 I've been pleased with some houndstooth scarves made for men in my life, using two shades of grey cashmere. Of course you need to enclose the floats on single bed Fair Isle, which I did by simply doubling the fabric end to end. If you doubled the fabric side to side you would need half as many passes of the carriage, but it may not be so symmetrical. 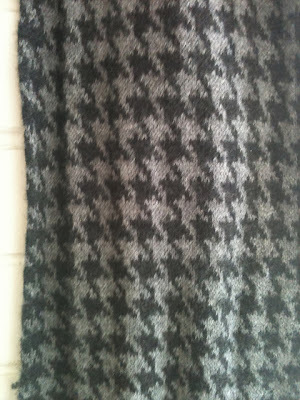 A piece of Fair Isle would also make a fine Messenger Bag, but I haven't done that yet. There are examples of more adventurous Fair Isle or double bed Jaquard pieces around. Just a couple of blocks from my house, Otto & Spike is a small company keeping the knitting industry alive and contemporary in Melbourne. Browsing their product range may inspire some interesting Fair Isle. Another source of inspiration might be the work of Lisa Anne Auerbach, an artist who uses Jaquard to send messages to the world. See a selection here. And if you are interested enough, read about her work. As for a simple garment for a man, you could do a lot worse than a Bog Coat. Now I know the web is awash with women wearing Art to Wear quilted interpretations of this ancient design, but the ancient simplicity of the design could well be reclaimed by a suitably determined male knitter. It is a design much better suited to the male body in my opinion. Despite the directions being for a woven interpretation, modelled by a woman, this article gives a bit of history and good diagrams of the structure.